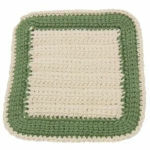 Granny Potholder -- A free Crochet pattern from Julie A Bolduc. This potholder started out as a granny square that did not work so to prevent frogging I continued on and made it bigger then folded it in half and created this potholder. See what can happen when you design patterns?